Ash and Braht, frenemy coworkers competing for sales, have been partnered to sell their friend, Tom’s huge home. This sets off a series of pranks and sabotages to give one the upper hand over the other. Yet what it really does is put the pair in a position to spend more time together, something Braht wants and Ash avoids. 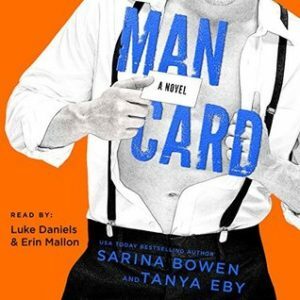 Man Card is the delightfully entertaining follow up to Man Hands. The story features the romance of Ash and Braht, the two best friends of book one’s couple, Brynn and Tom. We witnessed their sparks and clashing chemistry in Man Hands, and it only gets more explosive in Man Card. Ash and Braht are perfect for one another. After first getting to see the prickly pair in Man Hands, I wondered how the authors would pull off the enemies-to-lovers story. It works because Braht has had a thing for Ash from the moment the pair met, even though Ash doesn’t have a clue. I love how adoring and attentive Braht is. He’s smart and recognizes the need to play his cards right to make Ash his. He plies pressure when it’s called for, is just a friend when she needs it, and teases her to bring about her sass. He gets that she’s been hurt and knows time is what is needed to win her over. He knows Ash and worships her. His constant presence ends up being just what Ash needs. Ash is a work in progress. She’s mostly got her act together, but with the news of her ex’s parole, she flips a little. She’s confident to the core, but starts second guessing herself at times. Braht gives her the boost she needs to keep her head up, even if she doesn’t recognize it at first. While Braht knows his path, Ash has to find her way. She has to learn to trust her judgement again, and in doing so, we see her grow and develop. While the book is foremost a romance, I also love the friendship between the Ash and her two best friends – how they know they have each other’s back. Book one introduced the trio and in Man Card, we see more of how the group supports one another. They call each other on her bullsh*t, but accept each for who they are, flaws and all. The narrators for the book are once again Erin Mallon and Luke Daniels, and both are equally as charming and tenacious in Man Card as they were in the first book. As with the first title, I struggled finding the best playback speed, preferring Ms. Mallon at 1.25x and Mr. Daniels at 1.5x. I oscillated between the two speeds, but not necessary based on narrator. Ms. Mallon captures Ash’s confidence and sass, yet also brings strong emotions to the female characters. Her male characters are masculine and each unique. Similarly, Mr. Daniels brings all of Braht’s lust, frustration, and self-assurance to life, yet also gives him an undertone of insecurity when it comes to Ash. The only down for me is that I had finished listening to another book narrated by Mr. Daniels just before starting this one, and I heard similarities in the female leads that drew me out of the storyline at times. Overall, Man Card is a wonderful, humorous romance that left me content and happy. Ms. Eby and Ms. Bowen make an excellent writing pair, and I hope they continue to provide more delightful tales in the near future.